T. rex Autopsy: My Backstory | What's In John's Freezer? In early 2011, I got a fun email from a producer at National Geographic TV about a new project they were planning, which involved dissecting a full-scale model of a Tyrannosaurus rex in a documentary to be called “T. rex Autopsy.” Things fell silent for some months, then I got another email saying they were moving forward, then things fell silent again. Three and a half years later I got another email, this time from a producer at Impossible Factual films (working with NatGeo), saying that the show was finally moving forward for real. (This sort of thing is normal for documentaries; time scales can be long and unpredictable, or very fast-paced) This email invited me to be a primary scientific consultant in the design of the creature and show. Of course, anatomical dissection and T. rex are what I’m about as a scientist; two of my major research areas; so bringing them together was like a dream come true and I leapt into that dream with enthusiasm. Stomach-Churning Rating: 0/10. Merciful. No gory images here, just text descriptions and 2 glamour shots, for various reasons. The TV show is not for small children, though. I am guessing that the final programme will be about a 7/10 SCR because of gooey, seemingly rancid, but rubbery (so it doesn’t look overly real, but still looks great) dinosaur vital organs. For more pictures, see the links to tweets, trailers and news stories below. I introduced T. rex Autopsy to you in the previous post, I’ve been tweeting and retweeting extensively since then, and one of my later posts will be a “postmortem” of the show, which airs June 7 worldwide. My feeling is that, if what I’ve seen so far is indicative of the whole show, it will be a landmark moment in palaeontological documentary history. T. rex Autopsy fuses the best aspects of “Inside Nature’s Giants” with “Walking With Dinosaurs”, and without “Alien Autopsy” pseudoscience. Indeed, it seems to be a very science-based documentary (once you get past the requisite conceit that scientists could actually find a very fresh T. rex body– that’s the only sci-fi bit of the show, quickly dispensed with!). T. rex Autopsy is packed with evidence-based palaeobiology, and has consistently been so since I first spoke to producers, which was a great comfort to me. This post is about my role in the show, my perspective on it, and an attempt at a spoiler-free prelude. I’m willing to go out on a limb a bit and urge people to watch it, because I’m already proud of what was attempted in the show– it was a bold vision by NatGeo and laborious execution by everyone involved. I especially want to give a big shout of respect out to creature designers Crawley Creatures (led by Jez Gibson-Harris [interview here], who helped create Jabba the Hutt and the Dark Crystal beings, among others). 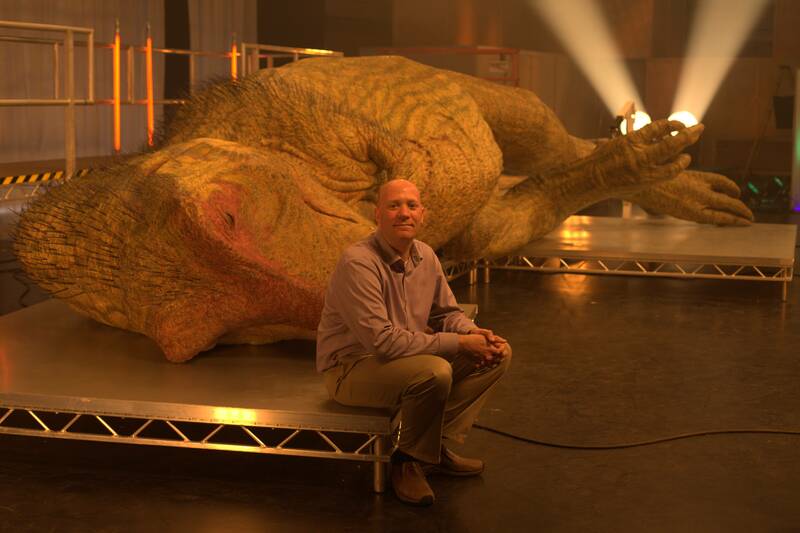 Around 14 people on Jez’s team worked full time for ~4 months to make the T. rex. The designers based the proportions on the Field Museum’s scans of “Sue”, which I helped them get access to (I’d used them for our PLOS ONE paper in 2011). That, and numerous comments on their draft dinosaur’s body proportions and limb positions (e.g. avoiding “bunny hands“), was some of my first major involvement in the programme. Over 200 emails (I was curious; I counted them!) 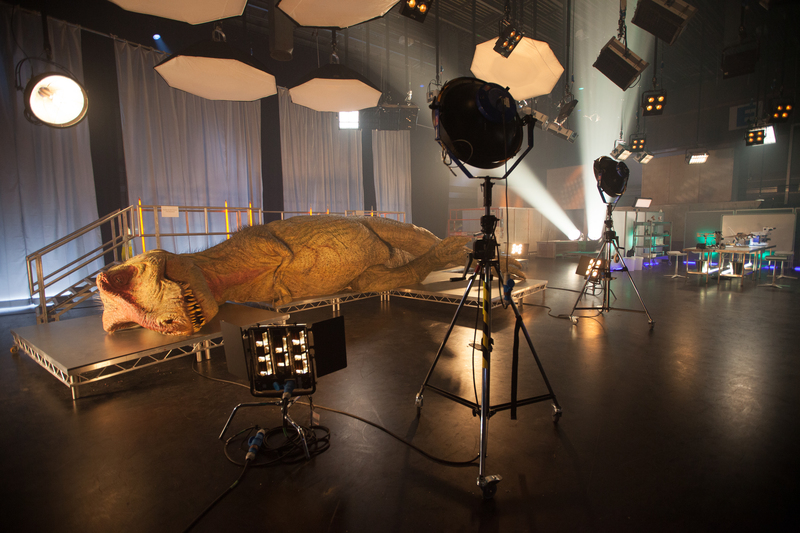 and a bunch of phone calls and 7 months later, my input on the T. rex Autopsy film shoot and production was finishing. Just last week, I sent what supposedly was my last email of input on the show, about predatory habits (NOT the dumb scavenger debate we’re all tired of; more about ambush vs. pursuit habits). I’d spent many hours going over drafts of T. rex‘s anatomy and function and behaviour from head to tail with the superb Impossible Factual film production team (mainly Assistant Producer Cressida Kinnear). Very often, to their credit, they’d already done a lot of literature searching and speaking with key experts on dinosaur jaws or brains or breathing, so I just had to check the fine details, but in some cases I had to recommend experts to speak to and/or do my own sleuthing and educate myself about aspects of T. rex biology I’d never pondered much. Did T. rex have feathers? This was important to get right, I felt, and not just show T. rex as a leathery or scaly beast, which is outdated. As I put it, it’s more speculative to show T. rex without any feathery thingies than to show it with some. We passed around draft images and thoughts and agreed on a slightly fuzzy, bristly body, especially in some regions of the head/neck, arms and tail tip. I encouraged the design team to go for more colour (I wrote to the designers “Skin colouring: go nuts! Feathery things should be colourful. Big animals tend to be more drab in colour but that doesn’t mean a boring grey/green, and certainly there should be some regional patterning. I like the idea of there being brightly coloured areas on the face”). We can be confident that dinosaurs could see colour like most land animals (except many mammals!) can. All of this is pretty familiar to palaeo-artists and fans of modern dinosaur reconstructions, so I won’t belabour it more. I’m glad that much of this made it into the final design. It’s not your overly familiar Jurassic Park T. rex. Cheeks, eye pupils, brain/senses, how big a mouthful of meat it could swallow, furcula (wishbone), gastralia (belly ribs- I gave a lot of detailed criticism here), reproductive anatomy and biology, eggs, body fat, growth, air sacs, stomach, and excretory system, among other things: we covered them all in discussing the dino’s design, and I learned a lot along the way. A memorable part of my discussions with the designers, in early March, was about the intestines and cloaca (rear-end opening): they initially put the cloaca too far forward on the body, I got them to move it backward, then I later realized in a panic that, making a neophyte error, I’d missed a key anatomical feature in the hips that clearly would put the “vent” even further backward, so I send them a hasty email apologizing that I’d missed this and urging that they fix their graphics and animations. I felt bad about this as it was late in the design phase and I’m sure I stressed out the team to make this change, but I thought it would be embarrassing to get the position of that hole wrong. Yet it was also funny to me to be scrutinizing where the “poop hole” of a dinosaur should go, and worrying so much about getting it right… my scatological sense of humour was in overdrive. By the middle of March they had this detail right. Phew! There is another dinosaur that makes an appearance in the documentary but I don’t want to spoil it. Suffice it to say that one dinosaur from another time period and continent was initially chosen, and I (echoed by Dave Hone, I know) urged them not to do that, choosing a more appropriate Hell Creek Formation dinosaur. Phew! Perhaps more about that later. Finally, of course we talked about legs and muscles and locomotion. I was filmed at the RVC discussing this, and it looks like it will be a cool segment, including an explanation of how the bones reveal the anatomy of the soft tissues of limbs and other parts of the body (i.e. bread-and-butter from my PhD thesis work). I hope that makes the final cut! (Edit: I’m told it has; yay!) There may even be footage of me dissecting a chicken and talking about enlarged and reduced leg muscles in birds, in any “making of” side-programme. A few minutes after I met Edwina. Still in awe. This documentary was a blast to be involved in and challenged all my skills as a dinosaur expert and biologist as well as a fan of documentaries, monster movies and anatomical artistry! I give a big hat-tip to NatGeo for taking the plunge on this adventure in the first place, to the amazing creature creators, to the film and production crew, to the many jovial journalists I met, and to the four faux-bloodied, surely exhausted dissectors starring in the show– and to Edwina. This was an impressive collaboration drawing together the best that the media, monster-makers and an international team of scientists (aside from the ones I’ve mentioned already, many others too!) can do together. I feel lucky to have been involved, and I think I’ll be looking back on this event as a highlight of my career, especially as a science communicator; much like consulting on Inside Nature’s Giants is a highlight. I’m as excited as anyone to see how it turns out. Just 2.5 weeks to go — are you excited too? What would you want to see in a T. rex dissection? Where would your first cut be if you did the dissection? “Jurassic World”, what’s that? As a big fan of both your academic and science communication work I’m eagerly awaiting the T Rex Autopsy. What happened to Edwina post dissection? Did you get to keep a little piece of her for posterity? Would be a really cool prop for seminars! Thanks Somantha! Sorry for the late reply. Edwina, I am told unofficially, was put back together and there are hopes for her to go on exhibit. I hope she goes on a travelling exhibit so people around the world can see here. But that’s all up to the powers that be. We’ll see! I didn’t get to keep anything but got some nice parting gifts and was very well fed, so I’m happy! Wow. Just wow. That looks absolutely fantastic, both the model and the program. I thoroughly enjoyed the Inside Nature’s Giants series and am now really looking fwd to this. The BTS video, in particular, has def got me hungry for more. 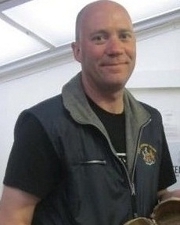 Really pleased that you were there to guide them scientifically, and that they seemed to have taken your input onboard. It was a great idea to have the T. rex dissected by people who weren’t directly involved in its creation – really adds to the truthiness of it all. Well, I think there was involvement in the design by some of the dissectors; I’d expect Steve Brusatte was consulted at least to some degree (he is after all a tyrannosaur expert!) but I don’t know the details of how much input the dissectors actually had. For sure, there was some input going on during filming, as the dissection was only loosely scripted, not rigidly, and I recall a lot of suggestions for different things to say being floated by the dissectors during filming. Thus there definitely was important input that shaped what you’ll see on screen. I think there will be plenty of neat surprises for everyone! Great post John! Yes indeed–I did a lot of consulting as well. Not sure if it was quite 200 emails worth, but it was substantial. I consulted quite a bit on the feathers, physiology, feeding, and general anatomy, and also ‘rubber stamped’ a lot of what you and the other consultants said about locomotion etc. (I suspect you guys had to ‘rubber stamp’ some of my ruminations as well!). It began with a trip to London last August and somehow, some way, culminated in that incredible shoot in April. Still hard to believe this all came together, and the initial clips and behind-the-scenes stuff I’ve seen has been great. I think we did good on this one. What was really satisfying, as you touch on in your post, is that Cress, Duncan, Alex, Paul, and the producers totally respected the science and really tried to get this right, and they both respected us and compensated us to a far greater degree than many other programs I’ve been involved in (NOT talking about Walking With Dinosaurs here, which I should state for clarity, is great). This is going to be truly awesome, and I can’t wait to see it! Please tell me they get their T-Rex in the show by accidentally reverse-evolving a budgie. Hi Stella, the “how” in the show, I’m told, is not really explained. They just get on with it- if we had a T. rex body, what would we do with it? Lots of photos of T. rex around London- how cool is that? Explains how it was done, without mentioning the show (too soon!). Who stuck ~20,000 goose feathers into the model T. rex? This guy! 6) be happy that a lot of science (including anatomy) is being conveyed in a heavily promoted documentary. That’s a victory in and of itself. See you on Sunday on Twitter, and probably on this blog later with my reactions! I liked this interview. Goofy fun, but got into some serious scientific issues, too. Like the show! I was thinking “Inside Nature’s Giants” meets “The Ultimate Guide: TYRANNOSAURUS REX” ( [url]https://www.youtube.com/playlist?list=PL473420881A34F18C&spfreload=10[/url] ). In any case, I’m glad you wrote this article. I’ve been a fan of your work since “Dinosaurs: Ancient Fossils, New Discoveries”, so it’s reassuring to see you so optimistic. There are just 2 things that seem weird to me. 1stly, in Hill’s review, it’s stated, “Edwina was missing her brain because there wasn’t enough good data to synthesize one. Only aspects of the model that could be signed off on by Hutchinson and the other scientists made it in” ( https://nerdist.com/national-geographics-t-rex-autopsy-is-a-roaring-return-the-science-special/ ). This seems weird to me given WitmerLab’s work on dino brains in general & T.rex brains in particular. 2ndly, also in Hill’s review, it’s stated, “T. rex Autopsy also covers…the scavenger vs. hunter debate”. This seems weird to me given what you said in this article (“NOT the dumb scavenger debate we’re all tired of; more about ambush vs. pursuit habits”). Sorry for late approval, Herman- your comment got caught in the Spam folder, which I rarely check! I can’t answer why Hill wrote that about the brain as I wasn’t involved in writing that bit. The brain is shown in the show as a digital model but wasn’t physically modelled. Taking it out of the physical model would have been hard and slow! I bet that’s part of the reason. As for the scavenger-predator, the last discussions I had w/the show-makers suggested it wouldn’t be in the show but I can see why they’d put it in, as the public still wonders about it. And it was featured but firmly stated that the evidence favoured both modalities, which is good. I watched. It was great. Really well done, everyone! I don’t know how many takes the dissectors had to do for various bits but it all appeared to flow pretty smoothly. I thought that Luke the Vet seemed a bit too much of a natural in playing for the camera so I Googled him and saw that he’s done Vet Adventures on Sky plus other stuff. *a dim lightbulb flickers on* Ah, I should have just clicked his linked name above. Anyway, the model was superb, as were all the key bits for dissection, except maybe the leg stump – looked like it was just all meat – but they made up for it by getting the organs and guts looking very real. It was really well shot and edited too, and there were nice little bits here and there (Luke even managed to get in the joke about him not needing to outrun a predator as long as he could outrun you). Too often dino docos are horrible so I would have been happy if this was just mostly good. In fact, it was excellent. Everyone involved can be really proud. Great to hear, Mark! Yes I remember having the same reaction with the leg stump, but if that’s the worst of it then that’s pretty damn good indeed. Just saw the show- it was good fun and pretty much what I expected! Omission of Xu Xing showing feathered tyrannosaurs was too bad but man they crammed a lot into 2 hrs! Anyway, I will do some sort of post-postmortem soon here… stay tuned! I don’t know where to start except for the thank you to the Nat Geo team in general for producing the most awesome two hours of television I will ever live to see. I mean, how ironic that the Discovery Channel’s Dino Lab, which depicted “live” dinosaurs in a laboratory setting didn’t produce nearly the same amount of awe as an animal that was supposed to be dead. There were so many things I didn’t cover in my own blog post, but since I know now that you were a key figure in producing this show, I feel like you are the right person to share this with. I apologize ahead of time if any of this sounds creepy or weird. Like many children growing up, I was a dinosaur nut. The Jurassic Park movies were my Holy Trilogy. The very first museum I had gone to that featured the Dinosaurs Alive exhibit was like visiting the Vatican for Papal Mass. And Dinotopia, the series of books that depicted dinosaurs living in a 19th century setting may as well have been the Voynich manuscript for as much time I spent reading them. So the fact that this documentary managed to bring out those same feelings in me as a thirty-two year-old man with a slightly more realistic world view since those days is a true gift. When I saw “Edwina” I had to actually remind myself several times that this was not a real animal they were dissecting. Although I was fascinated and impressed with seeing the organs and the inner workings of the creature, I nearly cried when her leg was severed, or the eye was taken out. I finally had to reach a compromise with my inner child. Okay, it’s sad that they’re dissecting it, but it’s dead and it’s not feeling any pain. That kept the waterworks down for the rest of the two hours. The rest of the time, all I could feel was a strong desire to reach out and touch Edwina, inside and out. Thank you again for your part in this. Wow, thanks! That’s great to hear! It goes to show what kind of wonders a dedicated TV show with a big team behind it can achieve. I hope that the show inspires people to support science and even become scientists. But at its core is the intention to entertain with something truly new and awesome, and to inform with good science. Praise like yours shows how that did happen; I’m sure you’re not alone in your feelings about the show, based upon all the good feedback coming through via social media. Thanks again for the comments! Congratulations John and Steve Brusatte,,,I found it was very positive in general and very well done…except probably in the “story”. It was generally so realistic, that I wish they could have found a better story on how they could possibly have “found” a T. rex carcass in the XXIst Century. I would have favoured even a time warp Blackhole argument or SciFi Time Machine instead of a “just so happens scientists have found a T. rex” … in these times of fringe creationists roaming about you can’t be too careful… the “time” or “age” element was somewhat missing… apart from that it was a superb boast of craftsmanship.